Details: Access this seven-pitch mixed climb (WI5, M5+) by driving to the parking area/winter dead-end of Camp Bird Road and hiking south towards an obvious wall for approximately 30 minutes. There are no bolted anchors anywhere on the route, so those going it alone must be competent trad leaders with experience in ice and, especially, mixed climbing. Why He Loves It: Ice climbing allows House to really discover and experience himself. Thus, he thoroughly enjoys BBB—a mini-alpine climb just 15 minutes from home. “It’s never extreme, but feels like I’m on a big mountain doing a technical alpine route, which is my favorite type of climbing,” says House. And, though it’s best for advanced climbers, those with solid intermediate skills can follow a guide or more experienced partner on the route. Must-Have Gear: Bring a headlamp—people underestimate the time required to climb and descend this route. Rappelling with a phone in your teeth counts as “negative bragging rights,” says to House. Make It Happen: You can go guided with House himself (skywardmountaineering.com/private-guiding). And be sure to strengthen up before you go. Check out the program here: uphillathlete.com/ice-and-mixed-climbing-strength-plan-8-weeks-beginner-to-advanced-intermediate/. Favorite Adventure: Ski Rocky Mountain National Park’s Hidden Valley in the morning and rock climb Lumpy Ridge in the afternoon. Details: A 10- to 15-minute drive from Estes Park, the former ski resort known as Hidden Valley is the most reliable, safe spot for ski touring in Rocky Mountain National Park. The lifts may be long gone, but those willing to skin reap the rewards with runs for all levels and a 2,000-foot drop. Afterward, test your climbing skills on Lumpy Ridge’s The Book, a sunny complex of spires and walls where the best all-trad, mostly multi-pitch routes range from 5.7 to 5.11. You can customize your adventure based on skill and energy. Why He Loves It: The combination of skiing and climbing linked by a mere 20 minutes of driving between them fill Cordes with joy. “With the crucial prerequisites—mountain skiing skills and trad climbing expertise—it’s impossible not to smile on a day full of fun human-powered skiing, gorgeous views, and sunny granite crack climbing. That’s hard to beat,” he says. Must-Have Gear: All your avalanche safety gear (beacon, shovel, probe) and the training and judgement that go with them; Hidden Valley may have once been a resort but it’s backcountry now. Make It Happen: You can go DIY with info from the park (nps.gov/romo/planyourvisit/winter_activities.htm). Or sign up with a guide service such as Colorado Mountain School (coloradomountainschool.com). Grab post-adventure Mexican food and a margarita at Ed’s Cantina (edscantina.com) in Estes. Details: To top out on this 12,890-foot peak in the heart of the San Juans, skin for three to five hours from Red Mountain Pass following whichever route avalanche conditions dictate: Take the southwestern side for low danger, southeastern at moderate and skip it altogether at high danger. Drop off the summit’s northwest side and cruise the sweet open basin that starts steep (about 40 degrees), but mellows out quickly. Traverse out to the west. Arrange a shuttle, or hitch back to your car. Must-Have Gear: A recently tuned and checked avalanche beacon, probe and shovel, and a thermos of hot tea. 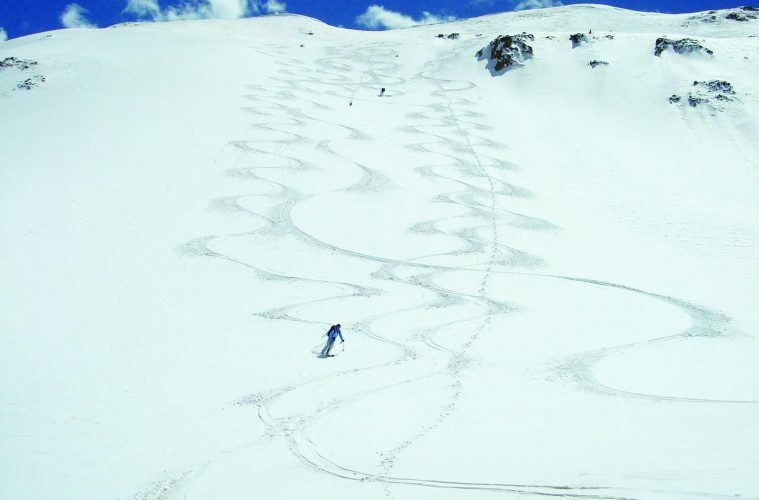 Make It Happen: Go guided with Gilbert or other stellar guides at Peak Guides (peakguides.com) in Ouray. If you are doing it alone be sure to call a local guiding company or check CAIC (avalanche.state.co.us) for avy and weather forecasts. Favorite Adventure: Ski to Tennessee Pass Cookhouse near Leadville/Vail or Pine Creek Cookhouse just outside of Aspen. Details: You need only ski or snowshoe one mile, with 300 feet of gain, to reach the Tennessee Pass Cookhouse where you’ll savor a delectable four-course meal. Pine Creek Cookhouse, where you’ll dine on locally sourced, responsibly raised meat, fish and veggie options, requires a fun 1.5-mile ski (or horse-drawn sleigh ride) through bare aspens and quiet meadows. Must-Have Gear: Her Black Diamond headlamp and Stio Hometown Down Jacket, for light and warmth on the ski out. Make It Happen: Be sure to make reservations at either destination and check the weather: tennesseepass.com/the-cookhouse; pinecreekcookhouse.com.